Elithion is internationally recognized as the expert in Li-ion technology, both in terms of its own products, and due to its ongoing efforts to educate all users of Li-ion cells and batteries about their safe and effective use, through publications, educational tools, presentations and participation in the social media. Far from being just another player in the Li-ion industry, Elithion is at the forefront of developing novel solutions to challenges presented by Li-ion applications. In particular, Elithion owns unique solutions to challenges encountered in the field of large arrays of battery modules. 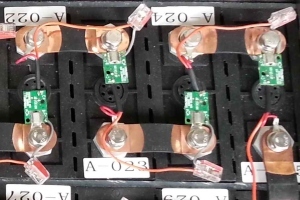 Elithion has devised proprietary, patent pending methods to safely connect batteries in parallel in the field, and to manage battery arrays with a varying number of installed modules. Elithion was the original developer of distributed BMS technology, which increments safety by minimizing the wiring inside a battery, without high voltage wires outside the battery enclosure.